If you are looking to have a beautiful flower garden full of thriving plants, the best thing you can do is take it one plant at a time. Start small and prepare that small area well by taking into consideration that each flower or plant you put into your garden has special needs. When you take the time to consider those needs, you will ensure the success of each plant and eventually your garden overall. The USDA Plant Hardiness Zone Map can help you determine which plants will survive the cool temperatures of your geographic location. Typically a plant tag will show two numbers 3-8. This means your flower or plant should grow well in USDA Zones 3-8. Another important factor to consider is how warm your temperatures can become. The AHS Heat-Zone Map can help you with determining plant heat tolerance. If the plant tag is showing four numbers...3-8, 8-1...the first set of numbers indicates the Hardiness Zones, the second set of numbers indicates the Heat-Zones. 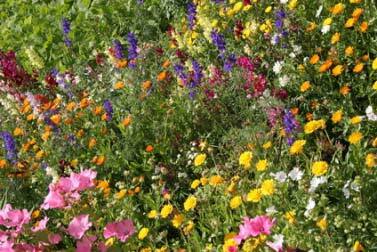 Your beautiful flower garden will depend on sunlight to some degree. Most perennial plants do well in 8 or more hours of direct sunlight each day. However, there are some perennials that prefer a little less sun, maybe 5-8 hours, with shade in the morning and full sun the remainder of the day. There are also those few plants that actually have a strong preference for just a touch of sunlight throughout the day. All plants need water or some measure of moisture. Some plants, black-eyed susan, coneflower, and sedum for example, can be categorized as drought tolerant, meaning that they can get by with a bit of moisture from time to time and still manage to grow quite well. Other plants, such as hosta, have an actual need to be watered on a regular basis in order to stay healthy and flourish well for any length of time. If possible, make it easy on yourself and your plants by locating your beautiful flower garden area near your water source. All plants appreciate a nutrient rich soil. Most flowers and plants prefer a loamy soil that is moist but also drains well. If you are fortunate enough to have nutrient rich loam in your garden areas, continue to care for it well to ensure it remains healthy and able to provide you with many years of beautiful blooms. If your soil is mostly sand or clay, you may need to amend or improve it by adding a good peat humus mixture. You can do this easily with each new flower or plant you put into the ground. If your soil is a poorly draining, heavy clay you may even prefer to make raised beds to put your flowers and plants in. Finally, when choosing items to plant in your beautiful flower garden, you will want to be sure that you purchase flowers and plants that are healthy and strong. If you buy from a nursery, take a look around while you are there. Are all of the plants healthy looking or are most of them wilting and "on sale" or discounted? You will want to choose plants with healthy stems that are strong and upright. Look for plants with buds as they will have stronger root systems and will adapt easier when transplanted. If all of the flowers in the nursery have blooms, choose healthy looking plants and before planting them in your garden, cut off all the flowers. Your plants will be able to develop new strong roots quicker without flowers and then will be able to produce new blooms for you within a couple weeks time. you WILL be ensuring the success of your beautiful flower garden...one plant at a time. The article featured on this page may be reprinted, subject to the Article Resource and Live Link as seen below being displayed prominently. Links may open in a new window but must NOT have a "no-follow" attribute.